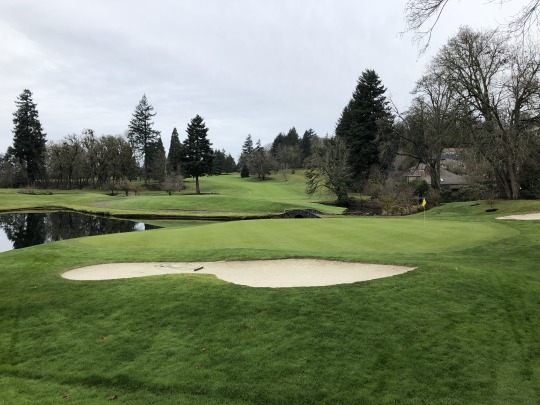 Even though I encountered several pleasant surprises on my holiday trip, no round was more significant than my stop at Eugene Country Club. That’s why I saved this review for last. This course is considered one of the top courses in the country, depending on whose rankings you are looking at. Golf Digest currently has it ranked at 128 on their U.S. list. 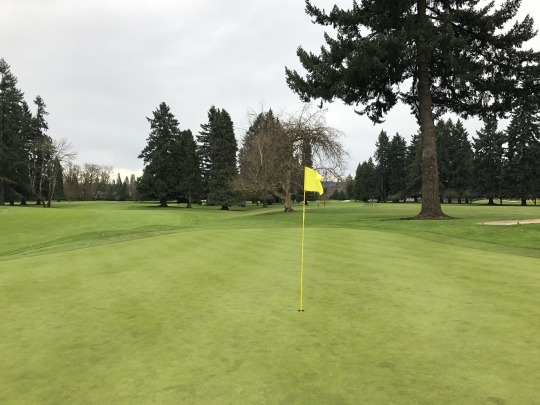 Eugene is a private club with roots dating back to 1899, making it the second oldest club in the state behind Waverly Country Club in Portland (1896). The original golf course was actually built in 1923. It was designed by H. Chandler Egan. The course was later renovated significantly in the 1960s by Robert Trent Jones, Sr. He essentially “flipped” the course backwards from the original layout. What is currently the 1st tee box area apparently used to be the 18th green and so on throughout almost the entire course. However, the fairways pretty much remained intact with no moving of earth. I personally found this fascinating. I don’t know Jones’ logic behind the reversed routing, but you can’t argue with the results. This is a fantastic course all the way through. 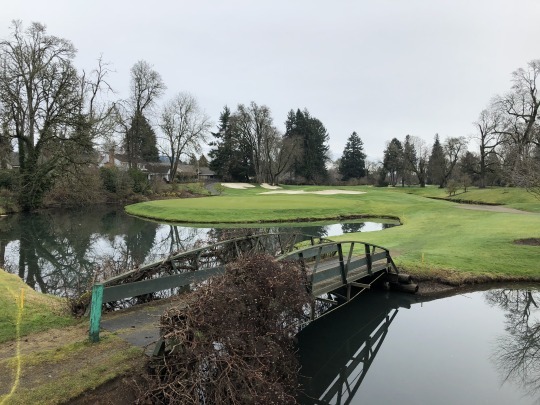 You can read more about the course’s interesting history on the Eugene Country Club website. 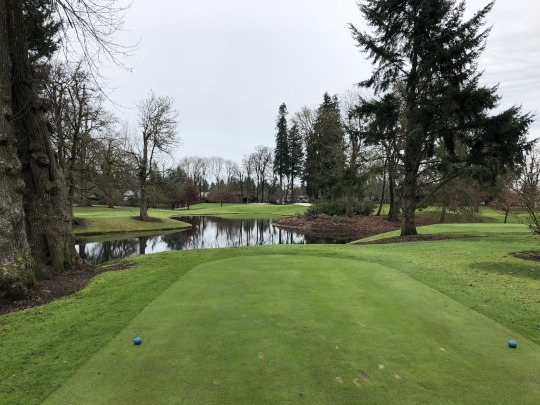 Knowing I would be driving through Eugene Friday on my way up to Vancouver, this was by far the most appealing course to stop and play. Of course, it is a private club and I had to make special arrangements to play as an unaccompanied guest. The staff was very accommodating and welcoming. 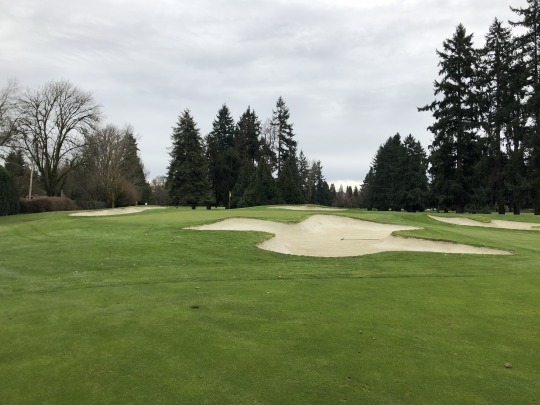 Considering the course probably doesn’t get a ton of play during winter, that may have helped my case. I teed off around 10:30 by myself. A cart was offered with no path restrictions (cart paths are actually very minimal throughout the course), but I noticed every other person out there was walking. I always enjoy walking special courses when I can and I didn’t mind stretching out my legs after a long drive. Plus, it was probably about 38 degrees when I teed off and it was a good way to stay warm during the round! I eventually caught up to some people on the back nine and actually joined a twosome for the final few holes. As I mentioned, everyone I encountered here was very nice and I never felt out of place as a solo guest. I was watching the weather all week beforehand and the forecast changed every single time I looked at it. That’s Oregon for you. Rain, snow and below-freezing temperatures all appeared at one point or another, but I was pleasantly surprised when the actual day came. It was quite overcast and gray. The bad news is it wasn’t as nice for pictures as some of the sunny (but still really cold) days I experienced on this trip. 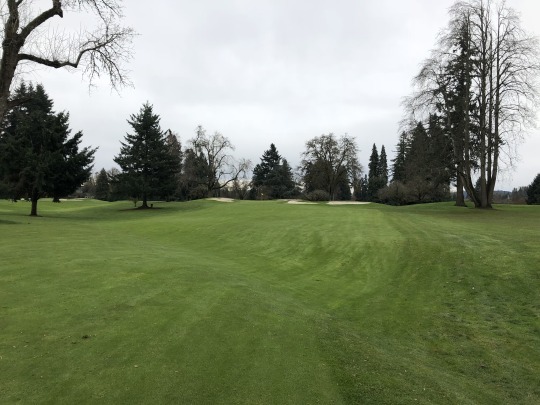 The good news is that there was no rain and the overcast skies helped prevent morning frost delays that could have pushed my tee time back. 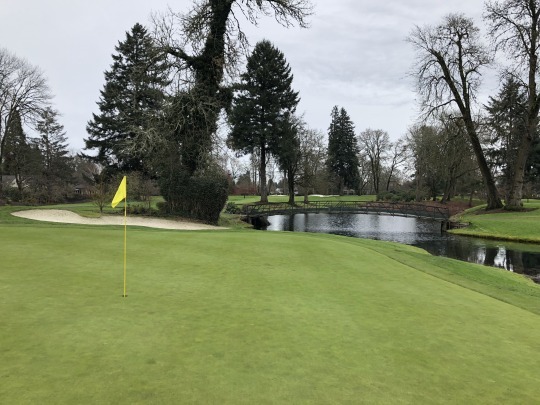 Eugene Country Club is one of the Oregon Ducks’ home courses and it’s where they won their NCAA Championship in 2016 behind Eugene-born coach, Casey Martin. 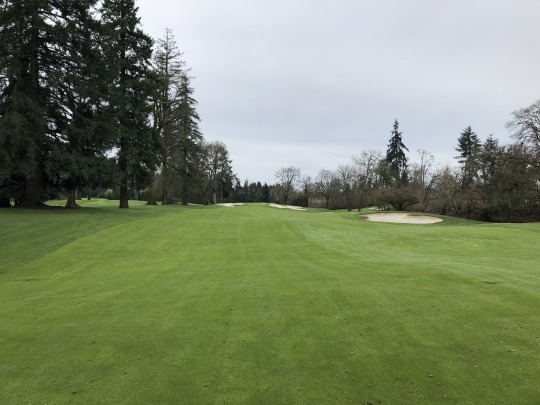 The course has hosted many big amateur tournaments over the years and the 2018 U.S. Senior Amateur Championship will be held there this year. It’s close to the university and just up the road from Autzen Stadium. 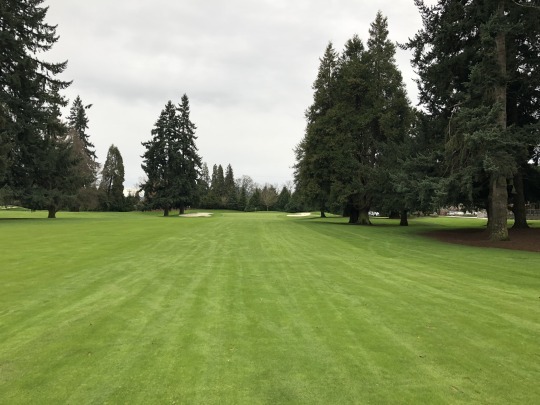 It’s one of those neat old courses where the city was kind of built around it, but you never feel any sense of civilization around you while on the property. There are some homes bordering the outside edges, yet nothing that encroaches on the purity of the course. As for the course layout itself, I really didn’t know much about it prior to my visit. I saw some of the NCAA coverage, but not enough to get a feel for the course. Plus, what you see on television doesn’t always translate to a firsthand experience. I learned that at Silverado Resort last year as that course really captivated me more than expected compared to what I’ve seen on TV coverage. 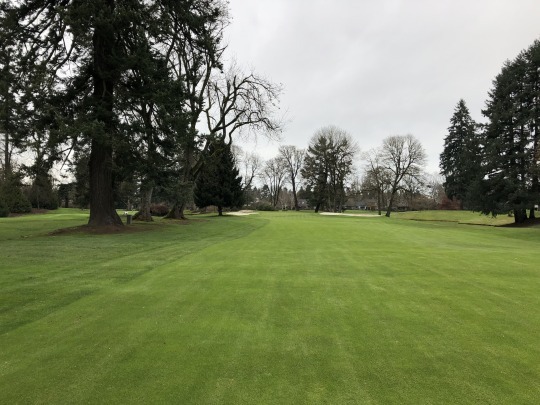 Much of Eugene Country Club is a pretty traditional design with tree-lined fairways and minimal changes in elevation. There are some narrow angles throughout and some more wide open holes, too, so it’s a pretty fair mix. 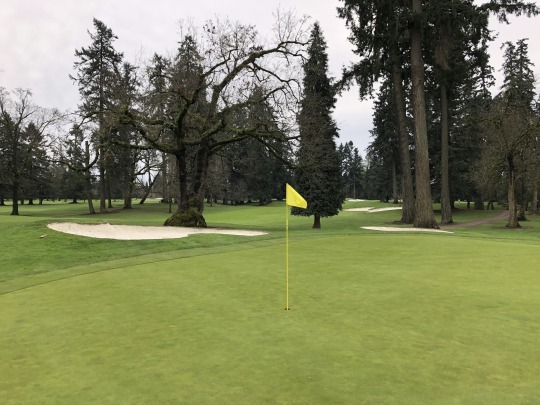 The green complexes are interesting and often much more deceptive than you think. To me, the highlight stretch of the course comes midway through the front nine. 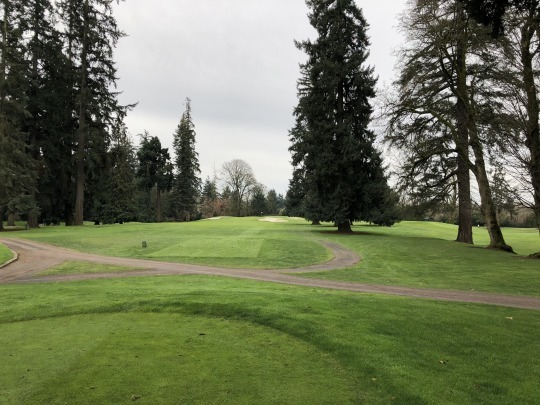 Holes 5-7 are kind of Eugene’s own “Amen Corner” in my opinion. These are three standout holes in a row. The 5th is a demanding par-3 that stretches out to 192 yards from the Championship tees. I think they may have an even further back box that they can bring out for big tournaments to really make this a beast. It’s hard not draw a slight comparison between this and the famed 12th hole at Augusta National. 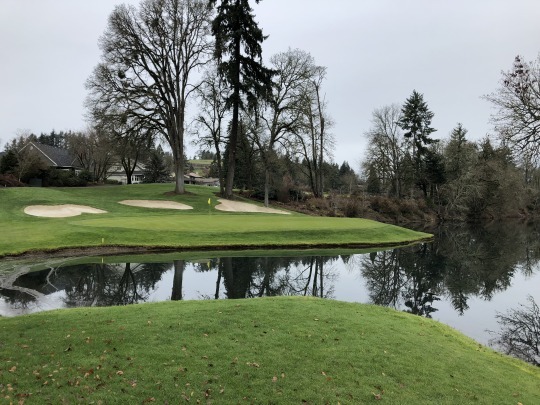 You are hitting over a crossing water hazard and the front/side edges of the green slope down toward the water with the grass leading all the way down to the hazard. 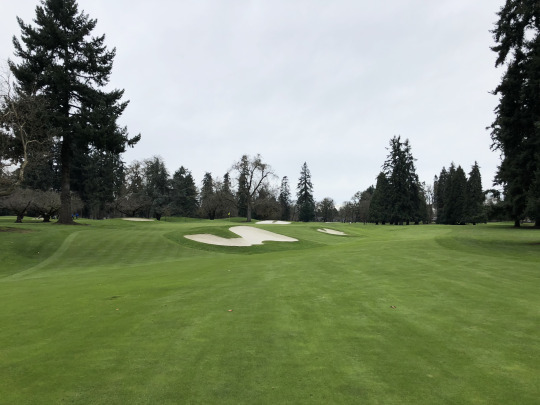 There isn’t a bunker in front like at Augusta and the green is much deeper, but the bunkers on the hill behind the green and the way things slope toward the hazard definitely felt like a northwestern cousin of one of golf’s most famous short holes. The 6th is a fun par-5 that utilizes the only real change in elevation on the course. 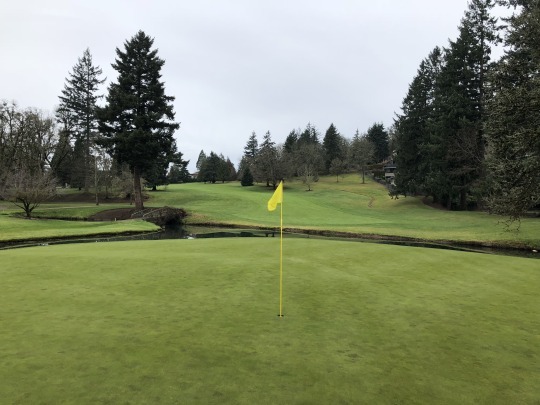 Your tee shot is uphill and then the hole is a sweeping dogleg right, eventually leading to a downhill approach to an intimidating peninsula green complex that also falls off toward the water in every direction. The 7th is another great par-3 over water. 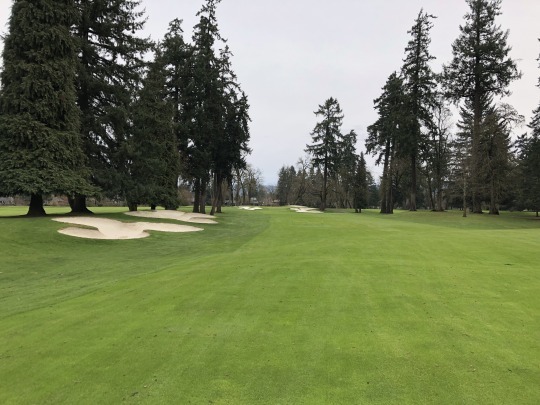 This one has a nice rock wall along the hazard to cap off the naturally sloping grass around the edges, so it presents a little different look and sense of challenge. 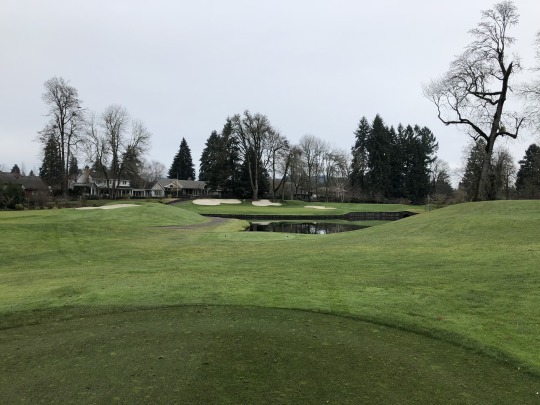 I was glad to be playing the white tees (6,400 yards, 71.2/129), which made this hole only play 140 yards over the water. From the further back sets, it gets over 200 yards. I walked back there and boy was it scary looking. 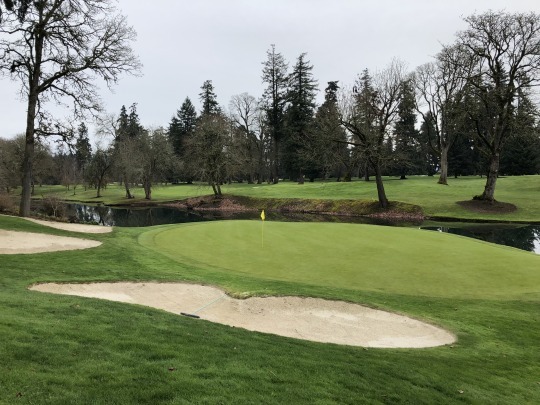 Speaking of awesome par-3s, the 12th at Eugene Country Club is no slouch either. This is another that plays pretty long from the back tees with a much more intimidating angle than from the whites. 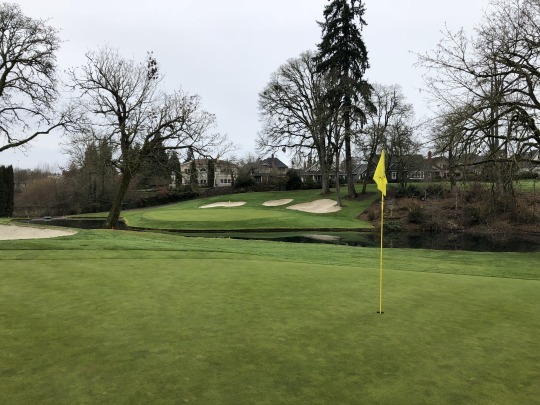 This one actually does have a little extra grass between the elevated green and the water in front, but there’s still not much room for error. 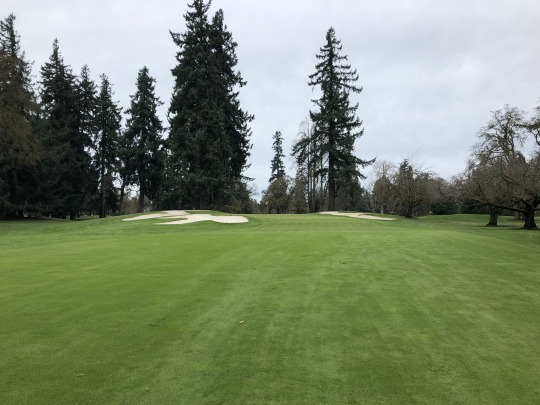 Perhaps one of the most impressive things about my experience here was the conditioning of the course despite such challenging winter weather in Oregon. 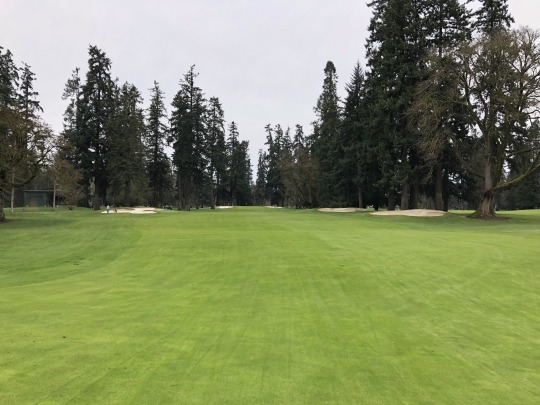 Kudos to the superintendent and maintenance staff for keeping this place so nice. Sure, there were some soft spots, but they were few and far between. Otherwise, this place was lush, green and nicely manicured from edge to edge. The bunkers were damp, but had excellent sand. 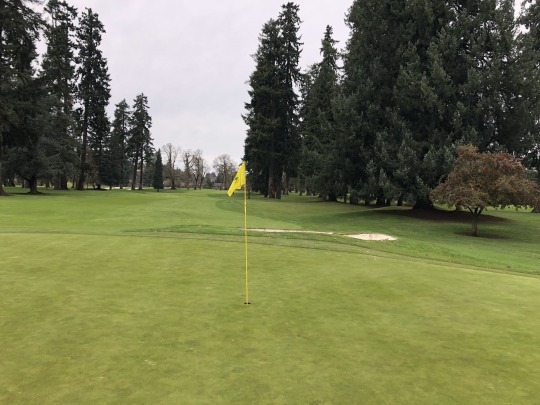 The greens were soft, but not too soft, and they were rolling so pure at medium/fast speeds. I’m sure they can really get these surfaces humming when they have a big event going on. 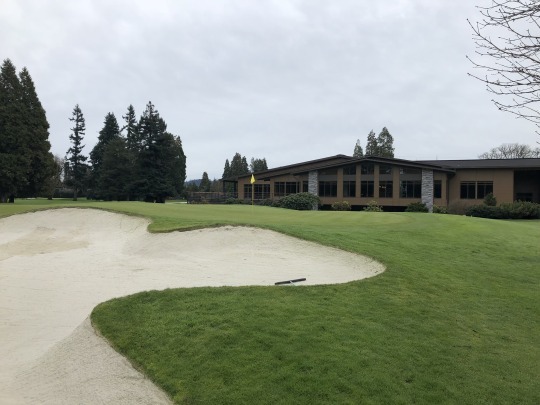 I’m not sure my pictures will do Eugene Country Club justice because of the gray skies, but you can take my word that this place is super nice. Not all of the layout will jump off the page at you. 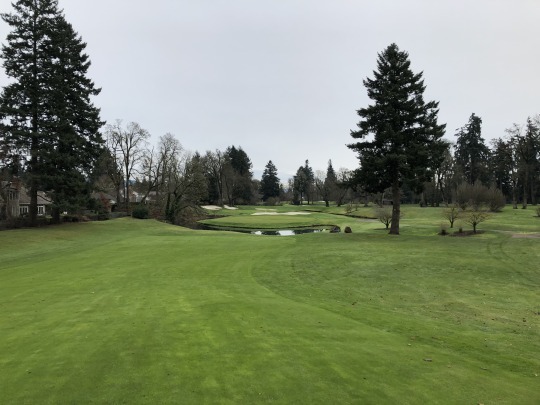 Much of it is still very traditional and old school in its approach, and then there are a handful of truly stellar holes to make sure you have some “wow” factor. When you put it all together, this is just a great course that will stand the test of time. It’s easy to see why it’s regarded so highly by golf reviewers and fellow golf fanatics like me. Central Oregon, Eugene, Eugene Country Club, Golf, Golf Course Architecture, Golf Course Photography, Golf Course Photos, Golf Course Reviews, Golf Courses, H. Chandler Egan, OR, Oregon, oregon golf, Robert Trent Jones Sr.